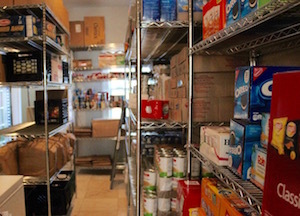 Inside the Springs Food Pantry. We are now well inside the full madness of the summer vacation scene on the East End. August always goes quickly around here. The harder you try to slow down, the more it catches up with you. And then, one day, when you thought the heat would never end, you wake one morning to a brisk chill, an east wind, and a chop on the water and you know the summer has already passed you by. If you haven’t yet jumped in the lukewarm waters of the Peconic Bay, the number of days in which you can still do so are dwindling fast. If you’ve been good, perhaps you’ve spent the summer gathering up your acorns for winter, squirreling them away for that cold day in February when having a little extra money in the bank means the heating bill will still be paid and there will still be dinner on the table. For far too many East Enders, this is a real dilemma. Despite the wealth along our shores, a significant number of us here make less than the federal poverty level of $24,250 per year for a family of four. That’s a staggering number, made even more stark by the realization that the federal poverty level is the same whether you live in Missouri or Montana or the priciest zip code in the United States. What does $24,250 per year really mean for a family of four on the East End? It’s simply not enough to even house a family of four in anything like humane conditions, never mind to keep the heat on and keep dinner on the table. To make matters worse, poverty here is compounded by the fact that many of our poorest neighbors make most of their money in the summer months, and spend the winter months barely scraping by. Enough food to eat is one of the most vital things a human being can have, and studies have documented that chronic hunger is a danger to one’s mental health, compounding the depression and anxiety that living on the edge already brings to a person’s life. We are lucky to have so many hard-working volunteers stocking the shelves at food pantries throughout the East End, and we’re even more lucky that so many of those volunteers understand that giving the people who come for food a sense of dignity is essential for their well-being. Feeding the hungry has come a long way from the days when a trip to the food pantry yielded a big brick of bright yellow processed cheese and some canned beef stew. Farmers and community garden members throughout the East End are seeing to that, planting rows, or even entire fields to provide food for the hungry. Our nascent food processing industry is also chipping in, with the Amagansett Food Institute now offering to turn fresh local produce into shelf-stable products for the winter. A local cattle rancher, Stephen Skrenta, has even gotten into the act, donating grass-fed beef pastured right here to the Springs Food Pantry. The generosity of our local food producers has been astounding, but farmers are among the East Enders who know too well how the fickleness of nature — from pests to drought to hurricanes — can quickly turn a bumper crop into a total disaster. Perhaps that’s why they give so much when they can. A good crop should never go to waste. If you have enough acorns of your own to give away today, please share them generously with your local food pantry. Winter is coming on fast, and the need is great. No one anywhere — especially in the wealthiest areas in the wealthiest country on earth — should go hungry. Hopefully one day the goodness of neighbors such as those mentioned in this important editorial won’t be needed.